Debugger – At long last we can finally get stack traces when errors occur. The feature that most interests us right now is the Debugging functionality. If you are not familiar with how basic errors, exceptions and stack movement is handled in kdb see our first article on kdb debugging here. In this short post we will only look at the new stack trace functionality. 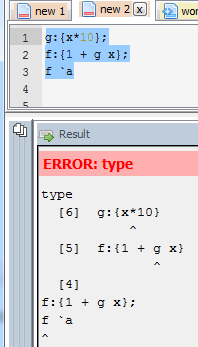 The good news is that this same functionality is availabe in qStudio 1.43. Give it a try: qStudio. Note: the ability to show stack traces relies on qStudio wrapping every query you send to the server with its own code to perform some analysis and return those values. By default wrapping is on as seen in preferences. If you are accessing a kdb server ran by someone else you may have to turn wrapping off as that server may limit which queries are allowed. Unfortunately stack tracing those queries won’t be easily possible. That’s just the basics, there are other new exposed functions and variables, such as .Q.trp – for trapping calls and accessing traces that we are going to look at in more detail in future.